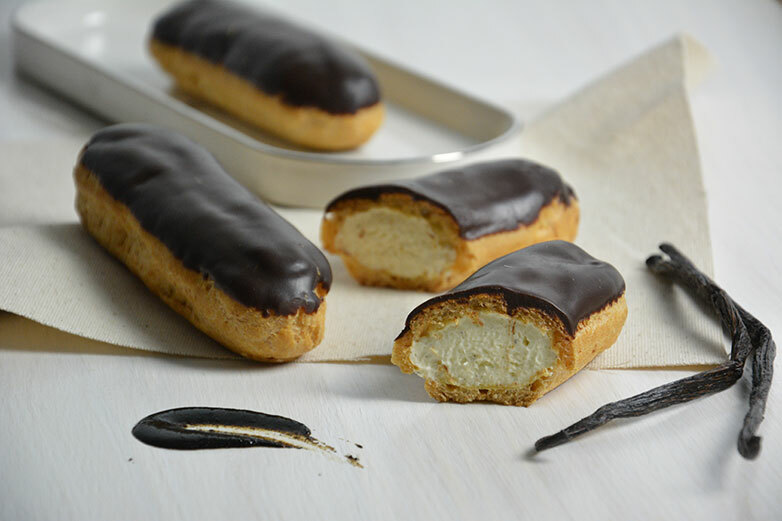 Our New Filled & Frozen Eclairs are revolutionary! Here are the top 5 reasons you need these eclairs in your store, bakery, or on your dessert menu. Our eclairs are thoughtfully handcrafted with all-natural ingredients and that is the ultimate reason why they taste as great as they do. When we decided to create our own eclairs, we took our extensive knowledge of ingredients and looked to our own supply of already incredible products to choose exactly what we wanted these eclairs to encompass. The result was fresh and buttery Jean Ducourtieux eclair shells, tantalizing Dreidoppel flavored fillings, and a generous layer of Luker chocolate ganache to top off the eclairs. All these ingredients combine to create an amazing, unmatchable taste. Regardless of whatever business you are in, these eclairs will suit you: in-store bakeries, patisseries, high-end dining establishments, you name it. Looking for a simple addition for your pastry case? The eclair’s natural look is beautiful and requires no additional work. Feeling a little creative and want to personalize it? Go ahead, top the eclair with some raspberries, espresso beans, or other minimal décor. Want to knock it out of the park? 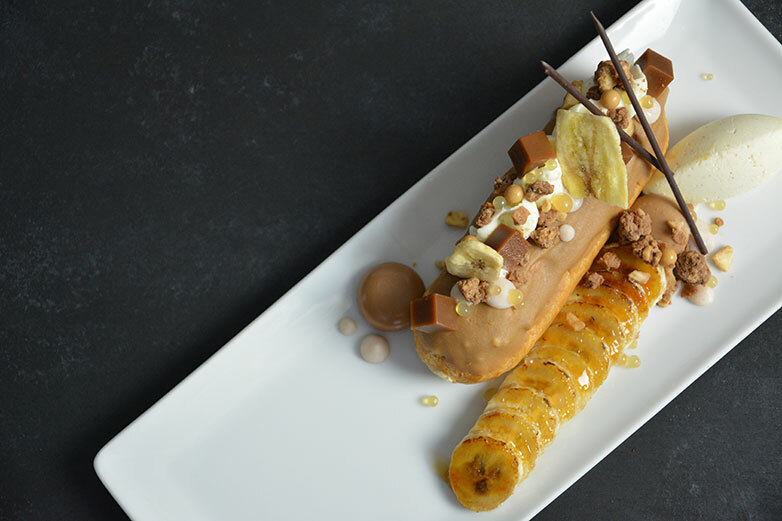 Use the eclair as base for a gourmet plated dessert and top it with an assortment of flavors and textures. The possibilities are endless! Vanilla and chocolate are classic flavors, and yes, we carry those too. But when was the last time you had a Bananas Foster or Pistachio Mascarpone eclair? Our eclairs come in a variety of flavors, including: Vanilla, Chocolate, Espresso, Chocolate Raspberry, Chocolate Peanut Butter, Peanut Butter and Jelly, Strawberries and Cream, Bananas Foster, and Pistachio Mascarpone. Having the option of more elaborate flavor combinations opens the door to customers with more extravagant palates and gives your business a signature item that sets you apart. Unique flavors are business drivers! A plus for in-store bakeries! Our eclairs have a 12 month frozen shelf-life, allowing businesses to buy a large amount of product to accommodate wholesale or large purchasing quantities, without the worry of a short expiration date. There are many more reasons we love these Filled & Frozen Eclairs, but we will leave it to you to take a bite and find out for yourself! Follow and “Like” our social media page as we introduce each eclair flavor and show them some love with #shareaneclair. For more information regarding the eclairs and how to purchase them, visit the eclair product pages or contact our Customer Service Team. 2019 Marque Foods, LLC | ifiGOURMET Holdings Inc.